Moose Silhouette Personalized Address Plaque - - perfect for your cabin in the woods, vacation lodge, mountain retreat, or anywhere you'd welcome a stray moose. 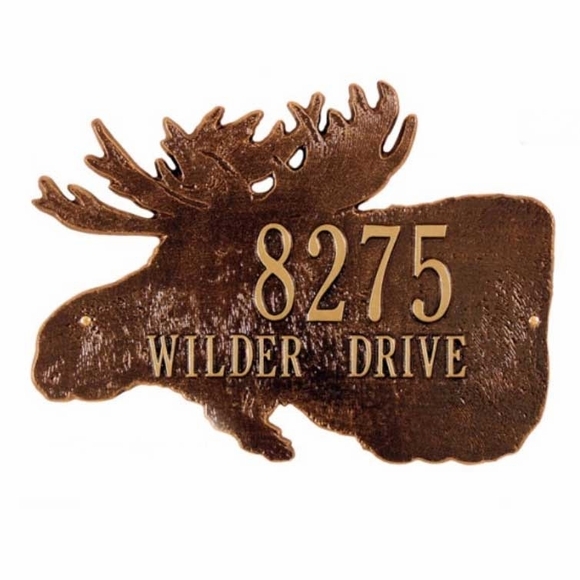 Moose shape address sign holds two lines of personalized text. Made in USA. Unique personalized wall mount sign is in the shape of a moose-head silhouette. Dimensions: 15.75"W x 11.5"H; weighs 3.7 pounds. Moose Silhouette address sign personalized just for you. Made in USA.